Casseroles have a bad rap. And rightly so if the spokesmodel for the category is that tan viscous, flaccid-noodled, hot tuna dish with potato chip topping. Oh, the inhumanity. I know people love the stuff. I, however, am of the other camp. Just entering Lent, I have had my share of flashbacks to Fridays when chances were at least a few of them would feature tuna casserole in Mom’s go-to red Pyrex bowl with gold embellishments. Lipstick that pig all you want, the stuff was horrid. No offense to Bunny, generally an awesome cook (discounting the liver and onions fiasco of my youth and her wayward foray into lima beans; bletch). The upside was that I would always consider eating the casserole as my Lenten penance for the day, freeing up whatever chocolate was around for guilt-free consumption. Upon further consideration of the humble one-dish wonder, however, what at first seemed to be the only casserole that was ever served in our house while I was growing up, was, in fact, one of many. Lasagna is a casserole. Baked ziti is a casserole. A casserole is simply foods baked together in a deep dish (thank you Marriam Webster!). Too many processed food-laden combos of the past (red-labeled soup company, ahem) have given this humble yet tasty and easy to prepare category of food and it’s 10×15 Pyrex vessel an undeserved bad reputation. Fresh, tasty ingredients and a happily stumbled upon recipe in the good old checkered Better Homes and Gardens NEW Cookbook lo these several decades ago have reminded me that casseroles can be a great addition to my repertoire and yours. They can be prepped ahead, heated and reheated, and even frozen in their container for later baking (no thawing necessary). You can feed a crowd without a lot of stress or money; add a salad and dessert and voila, dinner party! Enjoy! I am off to send a very necessary, I’m sure, peace offering to a certain baker of canned tuna. 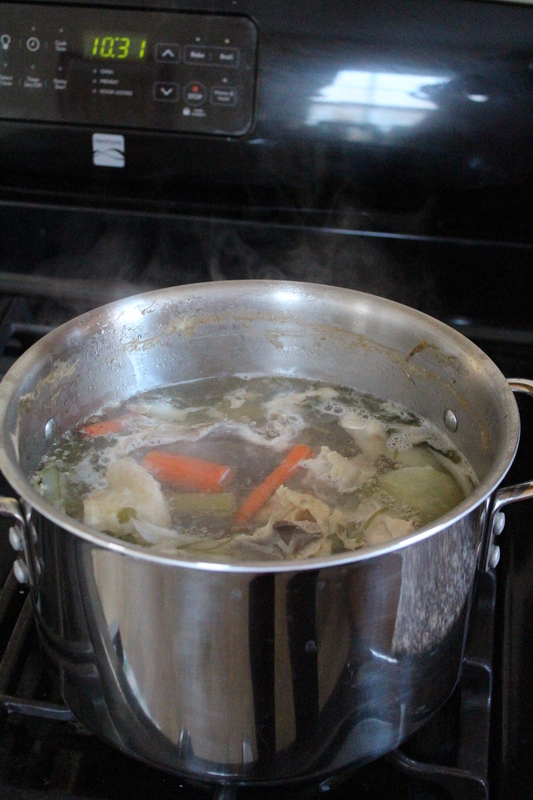 I start by poaching the chicken with carrots, celery, onions and peppercorns. I remove the chicken while it’s still tender and juicy (about 40 minutes), get all the meat off the bones and return the carcass and any extraneous fleshy stuff to the pot for an hour or so to make my broth/stock. 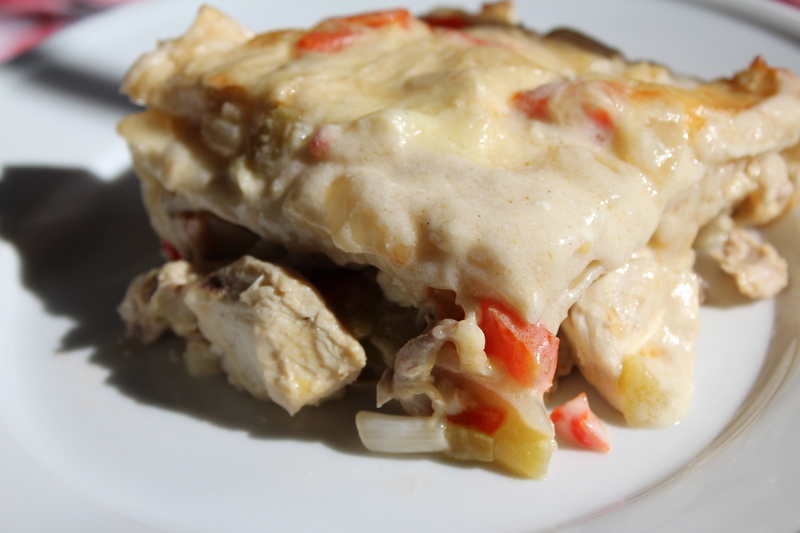 You can just as easily use a store-bought rotisserie chicken and boxed stock (low-sodium) for this enchilada casserole. I’ve done that plenty of times. But, there is the bonus when making your own that you’ve got plenty of stock/broth left to freeze for other uses. Chop the onions and peppers and sauté in butter until softened but not browned. Meanwhile, chop the chicken into about 1/2 inch cubes. Don’t mince, it’ll get an unpleasant texture during baking… sort of like hot tuna. Ha! 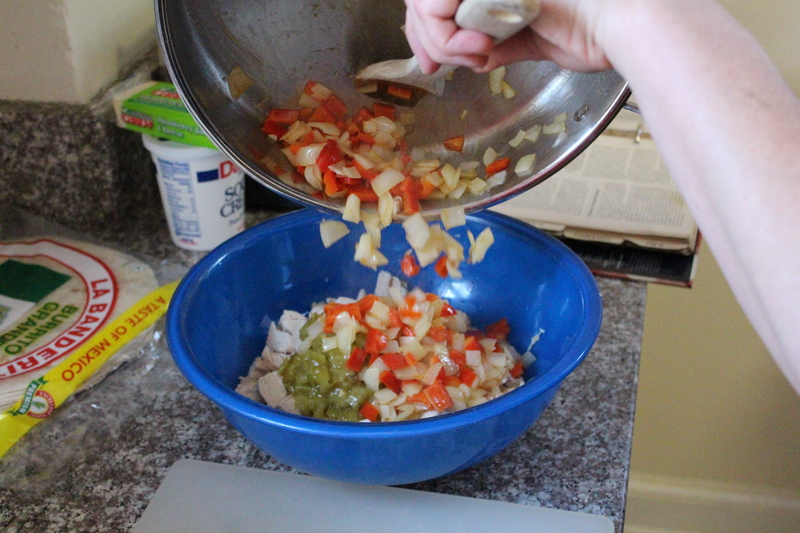 Put the chicken into a large mixing bowl and add the chopped green chilies. This is a canned product; however, if you’ve got your own, go for it. They should be roasted and skinned first (hence my use of canned). You should still have enough time to shred the cheese and have it ready for the sauce which is the next step. You can use pre-shredded, of course. 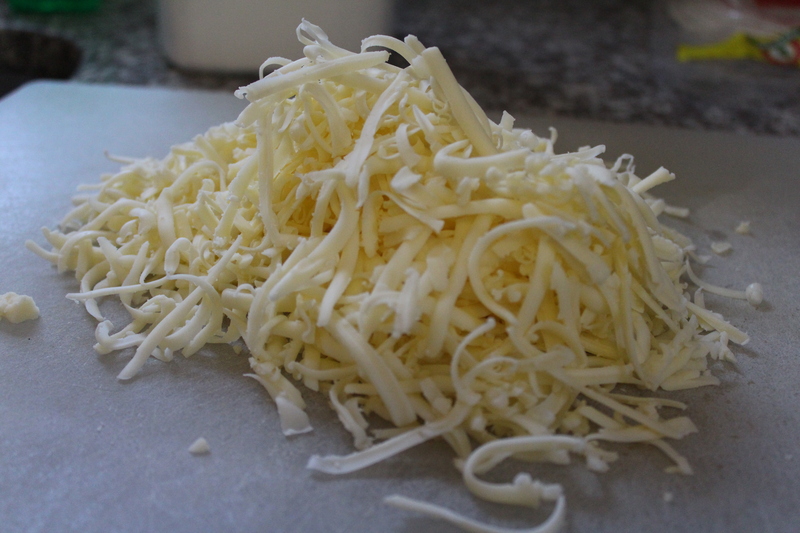 However, pre-shredded cheese generally has an anti-clumping agent added to it and – to me – doesn’t get the same gooey factor (which I love) that freshly shredded does. Once the vegetables have softened, add them to the chicken and green chilies in the bowl. Melt the butter in the same pan the vegetables softened inf (once they’ve been removed, of course). Add the flour, cumin and salt. You may briefly think you’ve done something wrong because it clumps up and looks like something you’d avert your eyes from if you saw it on the streets. Stick with it. 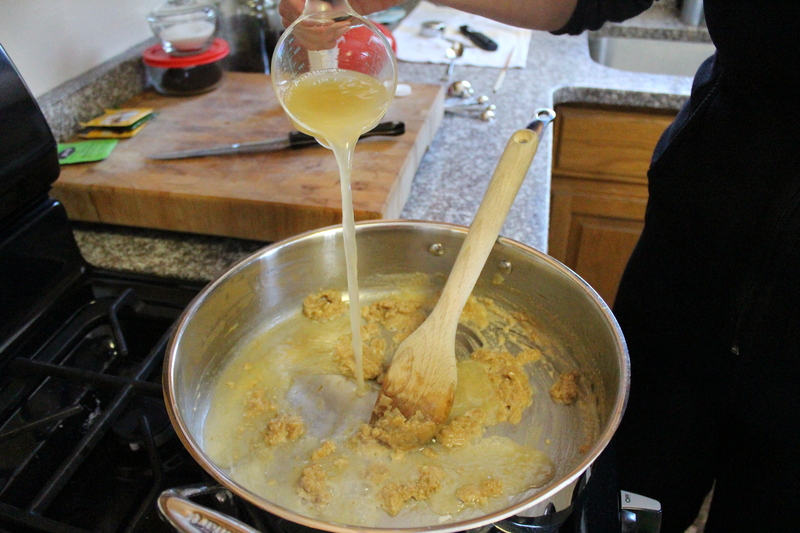 Once all of the dry ingredients and butter are incorporated, slowly add the chicken broth. Nope, still not going to look terrific but stick with it, stirring gently until it bubbles for about two minutes. Tada! Smooth and lovely. Now turn off the heat. Add the sour cream and cheese and stir until smooth. 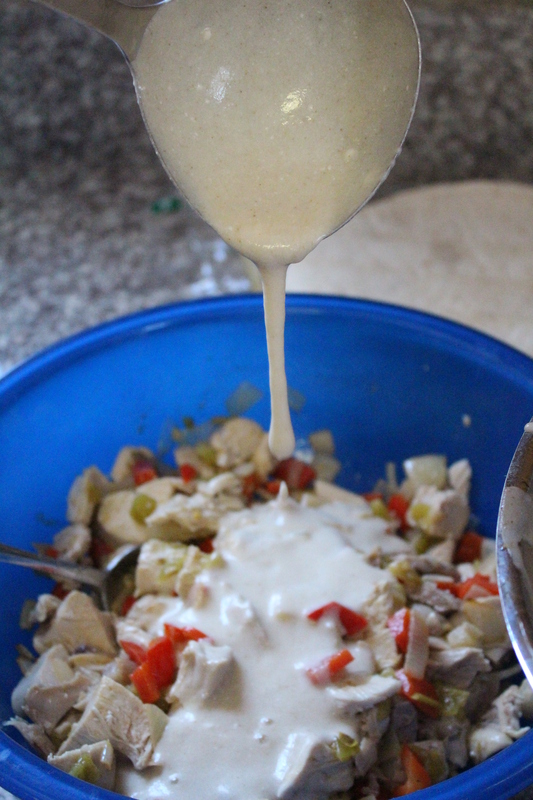 Add one and a half cups (this is a 1 cup ladle) of the sauce to the chicken and vegetables and mix in. Add another 3/4 of a cup to a greased (I use cooking spray) casserole pan and smooth to cover the bottom lightly. Now for the fun part! Fill each tortilla with about 1/4 to 1/3 cup of filling, just enough to go side to side without any falling out (you’ll find out what that means the first time you try to over-stuff one). Roll fairly loosely. During the baking, the tortillas will soften and the cheese will melt. If you roll these too tightly, you’ll get an unpleasantly dense texture; sort of like the stuffing cooked inside a bird. If that’s your thing, of course, rock on. Put the enchiladas into the pan as you assemble them; if you run out of room, skootch them together to make room for more. You’ll get 8 to 10 depending on how full you make them. 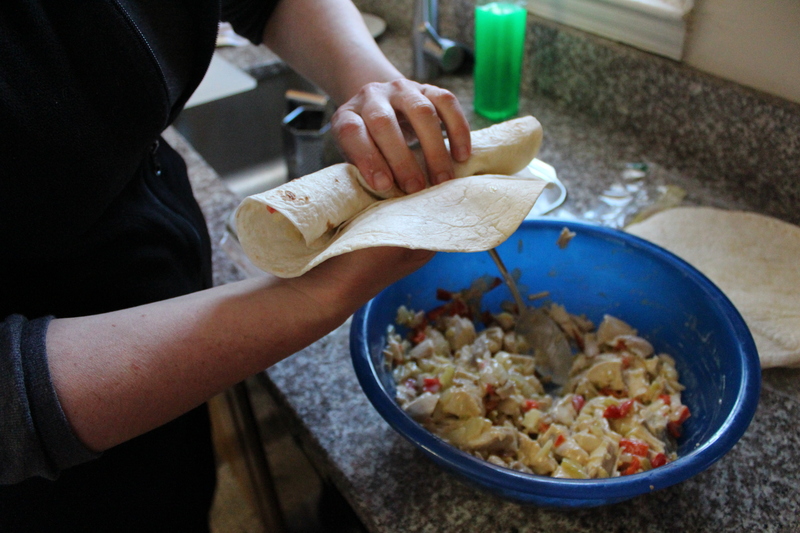 If you end up with filling but no tortillas, just tuck the extra filling around the sides of the rolled tortillas. Or just consider it a cook’s treat and enjoy. That’s my go-to solution. 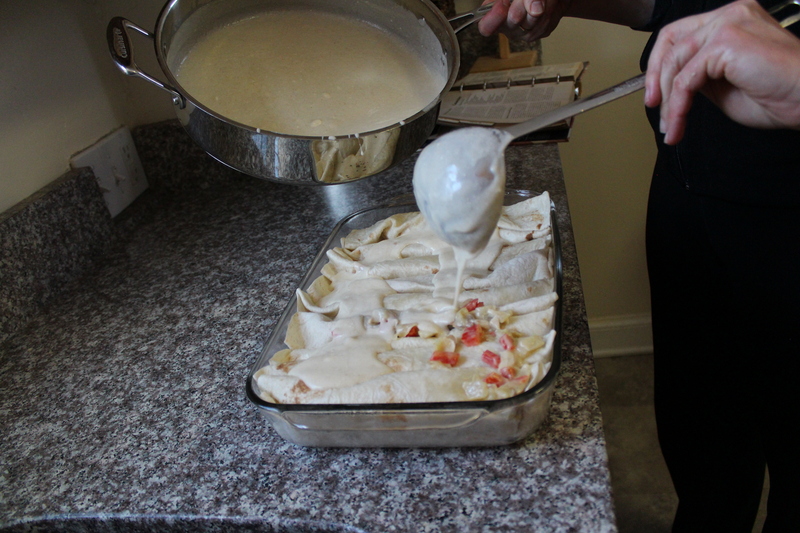 Ladle the remaining sauce over the casserole and smooth to cover the top and into the crevices. Sprinkle the remaining shredded cheese over the top. Bake until just gold brown on top. And for the love of all that is holy, let it rest at least 20 minutes. Otherwise, you’ll have kids still complaining a week later that the bumps on the roof of their mouths have not gone away. Protect the babies! A side note, I personally love when the top gets much browner and crunchy. However, if you don’t eat it right away, that which is overly browned and crunchy takes on an almost concrete-like texture. I call it brûléed and eat it anyway but others are not such fans. You can always pop an individual piece under the broiler and get the same result. Cook’s treat again! This really is a great dish for company; make-ahead, feeds a crowd, and you just need a salad and dessert to make everyone happy. Almost better (though having company trumps all), leftovers freeze and reheat wonderfully. Felices comiendo! Preheat oven to 350 degrees F. Spray a casserole dish with non-stick spray. In a large pan over medisauté um heat, cook onion and sweet pepper in 2 tablespoons of butter until opaque (about 5-7 minutes). While the vegetables are cooking, put the chopped chicken and chopped green chilies into a large bowl. Add the onions and peppers once cooked and stir to combine. In the now empty sauté pan, melt 3 tablespoons of butter over medium heat. Stir in the flour, coriander and salt to combine. Stir in the chicken broth all at once. Cook and stir until thickened and bubbly, about 3-5 minutes. Cook and stir 1-2 minutes more. Remove the pan from the heat and add the sour cream and ¾ of the Monterey Jack, stirring well to combine as you go. Stir one cup of the sauce into the chicken and vegetable mixture. 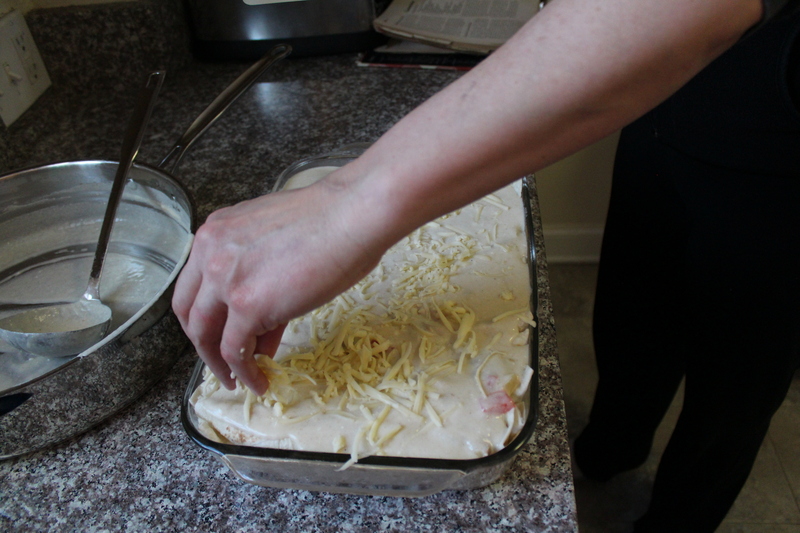 Pour ½ cup of the mixture in the bottom of the casserole pan and swirl to thinly coat the bottom. Fill each tortilla with 1/3 to ½ cup of the filling, roll tightly, and lay in the casserole pan snugly together. 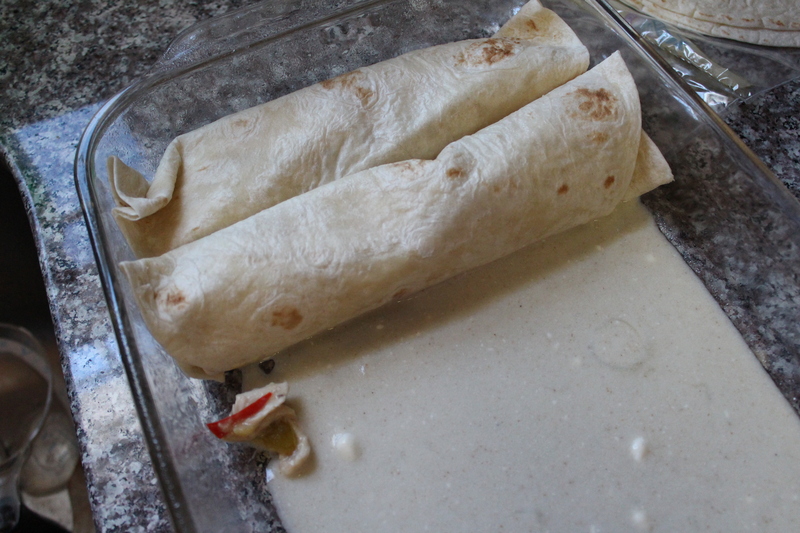 Pour the remaining sauce over the filled tortillas and smooth with a spoon. Sprinkle with the remaining Monterey Jack. Bake, uncovered, for about 25 minutes or until bubbly and just starting to get very lightly browned. This casserole holds in the refrigerator or freezes wonderful baked or not. If unbaked, I will bake directly from the freezer, adding about 20 extra minutes (the first half covered with foil to prevent over-browning). If it’s already been cooked, I suggest thawing in the fridge before reheating gently or … gasp, use the microwave from frozen. NOTE ON SPICE: For those who like more heat, use diced jalapenos or Hatch chilis and/or Monterey Jack with jalapenos in place of the chopped chilies and Monterey Jack respectively. This entry was posted in Casserole, Chicken, Main Dish, Poultry and tagged broth, budget friendly, Casserole, Cheese, Chicken, chicken broth, chicken stock, comfort food, Dinner Party, enchilada, family dinner, feed a crowd, Make-Ahead, Mexican, onions, peppers, stock, weeknight meals. Bookmark the permalink.